This is a clear and concise tutorial on creating an AVHC corner lockout for holes or any other features that requires a part to drop through it (square hole for carriage bolt, slot, round hole etc…). Also since multiple tools are created, this tutorial also sets up the CAD to generate g-code via the Machine Output. This tutorial is to be used at your own risk and if you have any questions please don’t hesitate to call Torchmate. We are using a 4’x4′ Growth Series plasma table by Torchmate, it has a plate marker and AVHC (blue screen) installed along with a Hypertherm Powermax 65 machine torch. 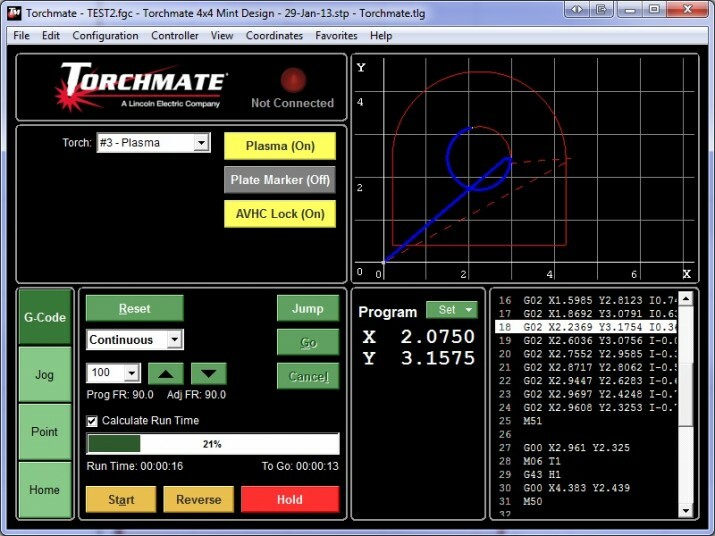 We are running Torchmate CAD 8 strictly for the CAM portion, so we are able to nest parts and generate G-code for the CNC controller software, Torchmate 4. 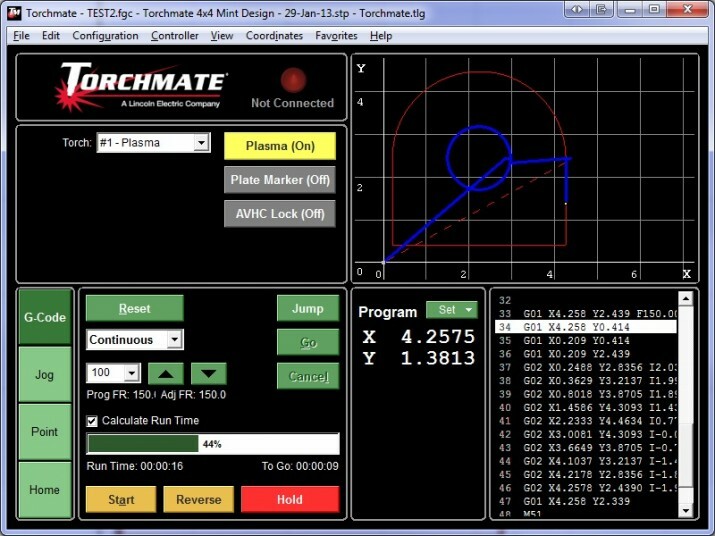 So if your configuration is a bit different, you may have to omit or substitute some settings, but this tutorial deals primarily with settings within Torchmate CAD 8 and Torchmate 4 CNC controller software. First off we have a fresh install of Torchmate 8. It takes a considerable amount of time to build up the material and cutting database. Depending on how many thicknesses and types of material you cut, you may be compiling this database for a while. The first step is to set up your materials. For this example we’re going to use 1″ thick mild steel as our material in this tutorial. So create “Mild Steel, 1-1.000”, input the thickness of “1.000” and click Add. Now to create a tool to cut this material. We create a tool that is a male tool path and a female tool path. All the female tool paths will be applied to the interior cut outs of the part and all the male tool paths will be applied to the perimeter of the part. We are also creating an online plate marker tool (as our table has it), if your’s doesn’t just omit the plate marker step. As you can see we already have a collection of Mild Steel toolpaths already created. For this example, enter “Mild Steel, 1” in the Name field, ensure Type “Plasma ” is selected. Now the parameter section D1 is the kerf width of your plasma cutter while cutting 1″ Mild Steel, in our case it’s 0.094″, enter in the appropriate D1 value. Ensure the Turret is set to “1” and the Priority is set to 3. If you don’t have a plate marker you can set this to “2”, but if you ever get a plate marker down the road you’ll have to change this, so it’s easier to just set it to “3”. Now you have one tool created that will be used to cut male tool paths. Time to create another for female tool paths. It’s the same process except note the differences. The Title is “Mild Steel, 1F” and the Turret number is “3” along with the Priority being “2”. The reason for the “1” and “1F” is because with future real world testing the cut speed of all your female tool paths will be slower (60% slower) which will create a larger kerf width. Defining a “1” and “1F” will allow you to come back into your tool library and update your D1 value for either cut speed. Now to set up our Plate Marker. 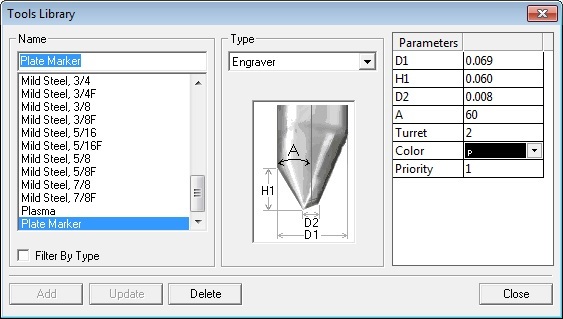 Set the Name as “Plate Marker”, Type to “Engraver” and enter in all the same Parameters as shown. The most important part is having the Plate Marker define as Turret “2” and the Priority as “1”. The reason it has the highest priority is because we don’t want any plasma cutting to begin until the part is fully engraved. Now is time to create tool paths with the created material and tools. 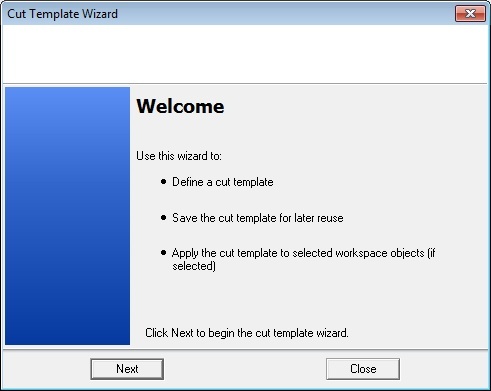 Go to Machine > Cut Template Wizard. Hit Next and click on Online and Next one more time. Select your material, in this case “Mild Steel, 1-1.000”. Click Next. 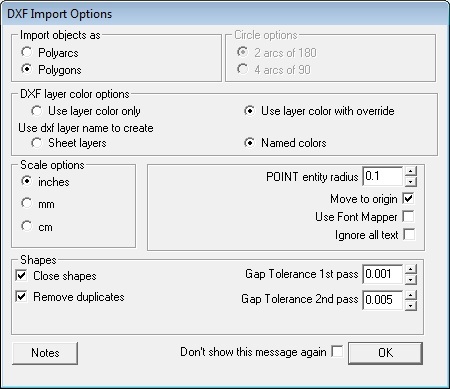 Select the “Plate Marker” tool for the current pass and enter in the Total Depth of Cut as “0.005”, this would be a typical depth for plate marking. Click Next twice and set the Cut Direction to “Climb Milling” as shown. For the Plate Marker the cut direction doesn’t really matter but with plasma cutting it does. 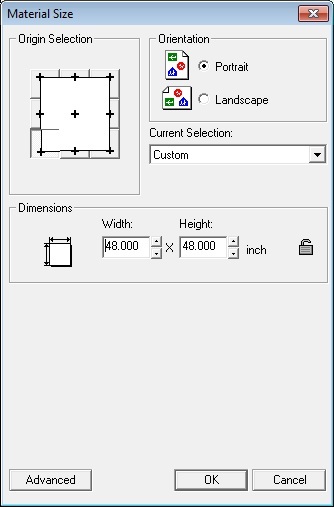 Click Next four times to get to the last screen to save the Cut Template Name as “Plate Marker”, click Add New and Close. Now you have a Plate Marker cut template 90% defined. Time to create the cut templates for a male and tool path to cut this 1″ thick steel. Almost the same process as last time. Go to Machine > Cut Template Wizard. Hit Next and click on Male and Next one more time. Select your material, in this case “Mild Steel, 1-1.000”. Click Next. Select the “Mild Steel, 1” tool for the current pass and enter in the Total Depth of Cut as “1.000”. Click Next twice and set the Cut Direction to “Climb Milling” as shown and the Tool Path Cornering to be sharp (the icon on the left). Click Next three times and enter in this information. Click Next and enter in the Cut Template Name as “Mild Steel, 1”, click Add New and Close. Now you have a male tool path cut template for 1″ thick steel 90% defined. Now we do this over again for the female tool path. Almost the same process as last time. 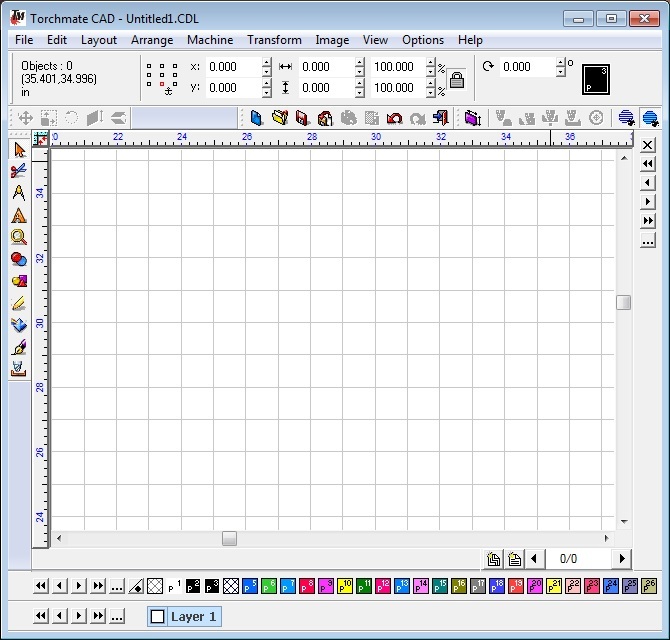 Go to Machine > Cut Template Wizard. Hit Next and click on Female and Next one more time. Select your material, in this case “Mild Steel, 1-1.000”. Click Next. Select the “Mild Steel, 1F” tool for the current pass and enter in the Total Depth of Cut as “1.000”. 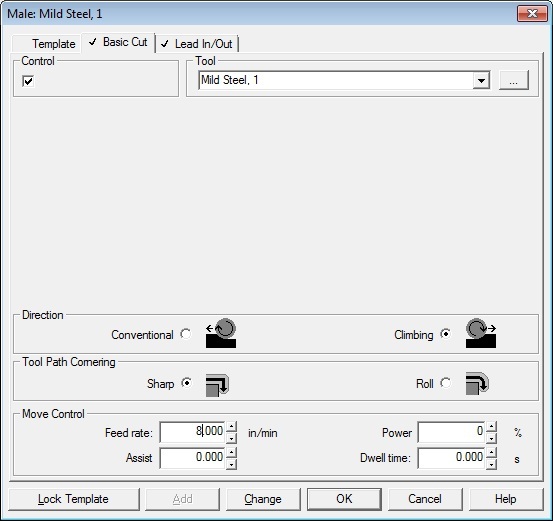 Click Next twice and set the Cut Direction to “Climb Milling” as shown and the Tool Path Cornering to be sharp (the icon on the left). Click Next three times and enter in this information. Click Next and enter in the Cut Template Name as “Mild Steel, 1F”, click Add New and Close. Now you have a female tool path cut template for 1″ thick steel 90% defined. As you can see this takes a lot of time when you’re doing it for many different thicknesses of material as well as types. Now to 100% finish of the cut templates, you need to bring a .dxf of any type into Torchmate CAD. You can do this via File > Import. Bring the .dxf file in with these settings. Go to Machine and make sure Use Easy Templates is deselected. Now for the “tricky” part. Click on the part that was just imported, it should be outlined in red. Go back to Machine > Apply Tool Path > Male… And make sure “Mild Steel, 1” Template is selected. Click on the tab Basic Cut at the top. Now this is where you enter in the Feed Rate, in our case with a Powermax 65 the recommended straight line cut speed for 1″ thick steel is 8.000in/min. Now press Change to associate that feed rate with that Cut Template. Hit Cancel. Now do this over again for your female tool path and plate marker. Reselect the part and go back to Machine > Apply Tool Path > Female… And make sure “Mild Steel, 1F” Template is selected. Click on the tab Basic Cut at the top. Now with this female tool path it will be slowed down 60%, this will allow for less taper in holes (at the expense of slower cutting time as well as more low speed dross). So enter in the Feed Rate, at 60% of the male it is 4.800in/min. Do this process over again, except go to Machine > Apply Tool Path > Online… Click on the tab Basic Cut at the top and set your Feed Rate for plate marking, we typically run ours at 75in/min. This tutorial was provided on Pirate4x4 by Jack at Torchmate. It can be seen here. Our procedure is virtually the same but there is some minor differences due to the male tool path being assigned to Turret #1, plate marker being assigned to Turret #2 and the female tool path being assigned to Turret #3. 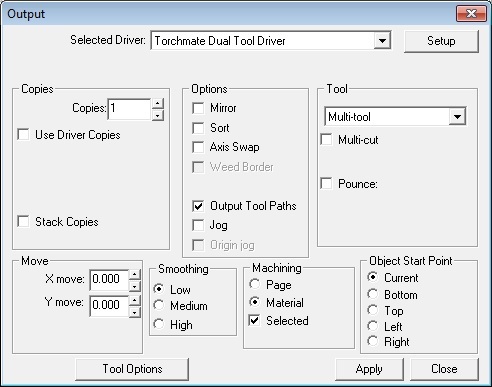 Go to Machine > Machining Defaults and under Selected Driver choose “Torchmate Dual Tool Driver”. Ensure that Material and Selected are checked under the Machining heading and that under Tool “Multi-tool” tool is selected. All shown here. Then click on the Setup button and enter the Machine Limits, in our case 48″x48″ and the height is 6″ (height doesn’t really matter). Click Apply, OK, then Apply and Close. 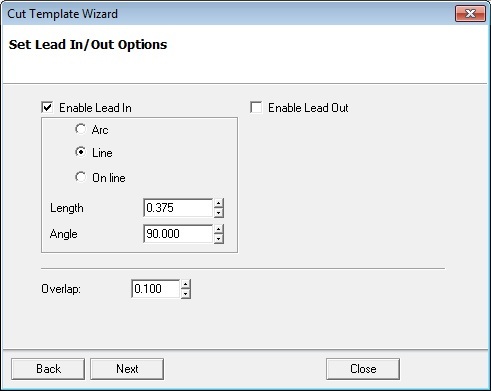 Check to ensure that the feed rate units are correct in Torchmate CAD, go to Options > Torchmate Setup > General Preferences and under General Units ensure that they are in “inches” and that the Speed Units are in “in/min”. 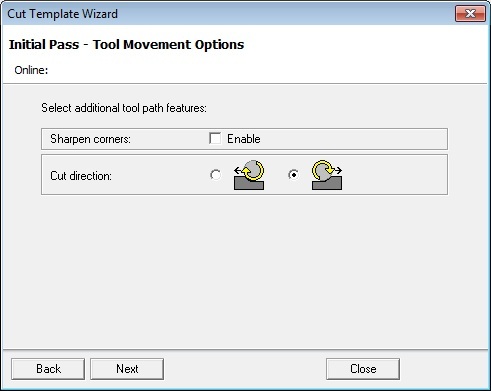 After all this Torchmate CAD is configured to a multi-tool environment and has different cut speeds associated with female paths and male paths. You can use the same technique to populate the Material and Tool Library for more male and female tool paths. Download this file. Everything you need is in it. 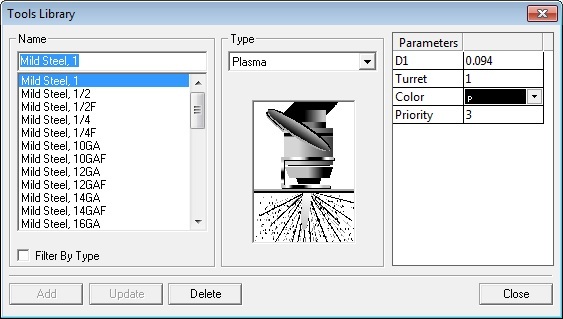 Open up Torchmate 4, click on File > Open Setup and load the file. Instead of explaining everything step by step it’s all contained within this file. This sets up a list of M-code definitions, macros, tool offsets (for the plate marker in relation to the torch) and tools so it will understand what is being exported from Torchmate CAD. Now that Torchmate CAD is setup and Torchmate CNC controller software is set up you can test a part. Draw or bring a part into Torchmate CAD that has a few holes. Select the entire part and go to Arrange > Break Path, if you part is completely solid and you can’t see the holes go to View and deselect Show Fill. Now select one of the holes and apply an online (plate marking) tool path. Go to Machine and ensure that Use Easy Templates is selected. Now go to Machine > Apply Tool Path > Online and select the “Plate Marker”. Now do the same with the other hole(s) but this time choose a female tool path, Machine > Apply Tool Path > Female and choose “Mild Steel, 1F”. Now select the outside profile of you part and apply a male tool path, Machine > Apply Tool Path > Male and choose “Mild Steel, 1”. Now you need to check to ensure the correct sequence of all these cuts and plate marking. There are many ways to do this, but for this example go to Layout > Sequence > Start Sequence by List. Then click on the Tool Paths Only button. Ensure all your plate marking is done before the cutting, the perimeter cut should be done last. Once you have this done, select OK. Location of the origin and material size is important. Now click OK. Make sure your part is located on your material, feel free to nest or array this part at this time (if you do, you will have to check the sequence again). Now you are ready to create the G-Code. Drag your cursor from one edge of the material to the other (so all the part(s) you want to cut are highlighted). Then click on Machine > Output… Now either click on the Cut Now button or the scissors. Save this file G-Code file (it should be saved as a .fgc). Now load the file into Torchmate 4 CNC software via File > Open G-Code… It’s a good idea to run the table offline to ensure that all the outputs are working as they should. Here is a video showing the workflow described with an imaginary part. Sorry we don’t have a microphone…but everything is self explanitory, the only thing adjusted was the feed rate, it was increased during the plasma cutting portion to save some time in the video. This entire setup allows the full control of cut speeds for internal and external features. adjusting the lead in and lead outs along with locking the AVHC when the torch is slowed down for cutting internal features. Along with this is full control of kerf width for internal and external features, since the cut speed is different the kerf will be as well, this can only be determined by real world testing. However with the tooling set up the way it is, it allows for easy refinement of the kerf and/or the cut speed down the road. Now this takes care of the CAM to CNC portion, there is one thing left wiring in the control unit to the AVHC to switch the corner lockout off and on. This step is the easiest part. 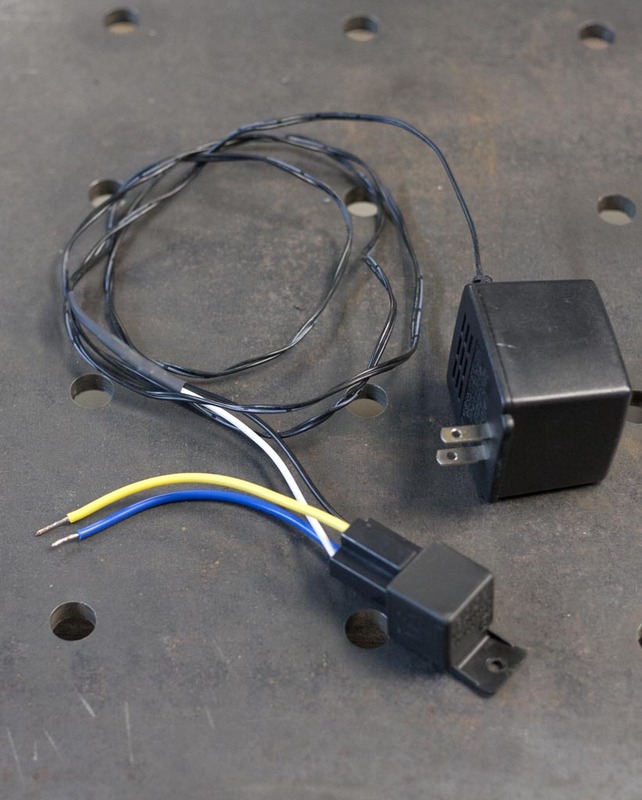 Take a 120vAC to 12VDC power supply, cut the ends off and wire it to a standard 12v relay (pin 85 and 86). Here it is before it is plugged in and wired. The yellow and blue wires (pin 30 and 87, normally open connection) are then connected to the corner lockout terminal on the back of the AVHC. Plug the power supply into the universal two channel relay box and this will allow the software to control the hardware and ultimately turn on and off the AVHC when needed. Here at Mint Design we’ve been doing some tweaks with our Torchmate CNC table. One great feature of the table is the “auto” torch height controller, which adjusts the height of the torch in reference to the material. So if the material bows or sits on the slats at an angle the torch will compensate for this and allow for a consistent torch to workpiece distance. This ensures less chance of crashing the torch due to tip ups, minimal heat input, consistent kerf width and most importantly improves edge perpendicularity. There is some drawbacks with the existing Torchmate system, which is why the AVHC hole lockout is created. When cutting a hole the perpendicularity of the hole is important, having a hole with less taper ensures that that the hardware will fit and also improves the joint strength due to reducing stress concentration on the bolt vs. a tapered hole. To achieve a hole with less taper you must slow the cut speed down, a typical rule of thumb is 60% the straight line speed. This is a rule of thumb, because when a hole is larger in diameter the closer to 100% straight line speed is achievable but if it’s a small diameter hole it requires a slower cutting speed. The only major drawback to slowing down is more low speed dross, but this is a small price to pay for a hole with minimal to no taper. Now how is this achieved with Torchmate CAD and the Torchmate 4 CNC program? Assigning different tools for different tasks. For example for one material type and thickness you will have one male toolpath and one female tool path assigned, the male toolpath will be 100% straight line speed and the female tool path will be 60% of the male cut speed. The male toolpath will be assigned a turret #1, while the female will be assigned turret #3 (our plate marker has already been assigned to turret #2). When a .dxf has been brought into TM CAD a female tool path is applied to all the inside features, and a male is applied to the exterior of the part. The sequence is checked to ensure that all the inside features are cut first. Then the tool paths can be exported via the “Machine”, “Output” function. The Torchmate 4 CNC needs to be set up accordingly to read the G-code coming from the Torchmate CAD. This is all done in the “Configuration”, “Programming”, “M-Code Definitions” and the “Configuration”, “I/O”, “Output Lines” section. This will be explained in greater depth shortly. Here are two screen shots showing the TM4 running offline to simulate what would happen. Notice the hole being cut at 90ipm and the AVHC Lock being on, and once cutting the exterior of the part it is cutting at 150ipm with the AVHC Lock off. This allows for the best of both worlds, less tapered holes and AVHC when it’s needed. One simply has to connect a 5v relay to the output of the controller and wire the relay to the corner lock inputs on the AVHC to enable this feature. This will be described further once this is actually done. 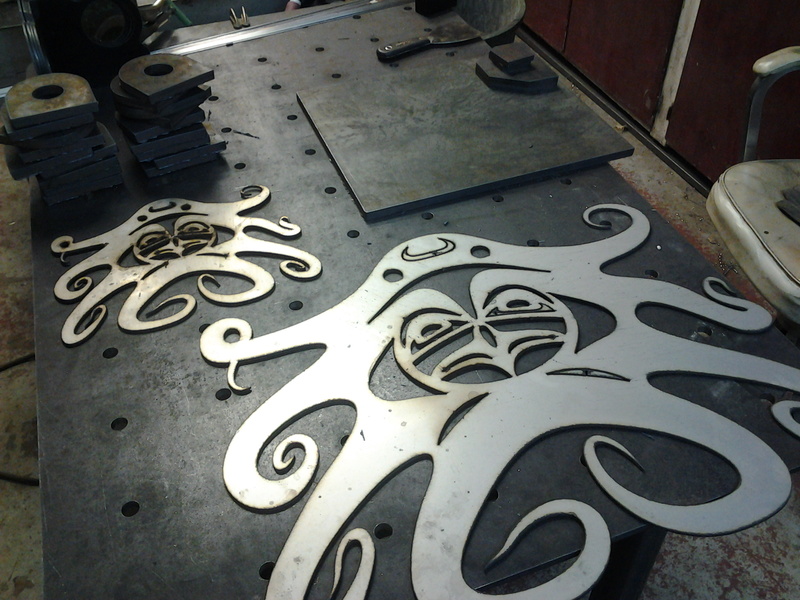 We’ve been busy CNC plasma cutting out a variety of parts. Everything from two 1/8″ 304 stainless steel CNC cut octopus to 3/8″ and 1/2″ structural plates and lifting rings to supply local fabricators. The structural components are easy, just need to have the dross removed and wiped clean. The octopus’ in this photo came right off the table. So they need a few pieces to be knocked out, all the dross removed from the backside and then they can be lightly orbital sanded across the face of the part. Then they will be carefully packaged and sent off to the customer in Victoria, BC. It’s always interesting going from mechanical/structural parts that require the use of thick material to delicate artsy pieces that need to have a very high visual appeal when completed. We have no problem switching tasks, as all these pieces were cut in a span of an hour, going from fine detailed work to high power, slow cut speed tight tolerance work. We have all the necessary tools in house to make it happen. For more info about our CNC cutting services, please take a look at our CNC cutting page and don’t hesitate to contact us for a quote. We operate our shop as lean as possible so our material is normally 1-2 days away if we don’t already have it in stock. We do keep a variety of large sheets in stock that our more frequent customers need access to.